I have the old Bob Dylan rain song running in my head at the moment, A Hard Rain’s a-Gonna Fall. Patti Smith famously sang this song at the Nobel Awards ceremony, as she represented the absent poet/songwriter/performer. Dylan’s hard rain is a metaphor for tough times and the likelihood of them getting tougher. Were there ever more depressing song lyrics? The times were tough. Not only in the United States. Globally too, there was a depressing culture of injustice, suffering and warfare. Last week, I had a day of depression. I don’t know how else to describe it. Something like a twenty-four hour emotional flu. When it was on me, I felt as wretched as you do when you have a lightning dose of the flu. Laid low by my mind and spirit, not by my body. What brought it on? I’d like to be flippant here and say, the usual. Communication breakdown, relationship difficulty, feeling separate. 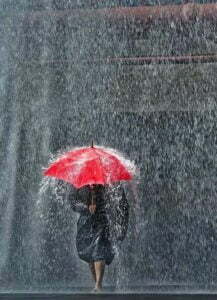 But when this sort of hard rain comes, it’s difficult to see my way clearly, to answer how and why and who. This short term depression is all there is when it happens. Raw feelings that are accompanied by here-we-go-again. My mood lifted in relatively short order. I know enough to try to reach out, even though it’s the last thing I want to do. I came across an Elephant Journal article after my ‘flu’ episode called ‘Everything the Buddha Ever Taught in Two Words‘. History proves this. The Civil Rights legislation miraculously passed. The Cold War was resolved, and the Vietnam War finally ended. Apparently, Bob Dylan even recorded an upbeat version of ‘Hard Rain’ during a 70’s concert performance. Yes, I plan on keeping the Buddha’s two words on a mental post-it note. For me, it’s so important to remember that there are always kindly people close by–even if it’s a phone call away. I think I had that same FLU just a few days ago. Thank goodness everything changes! To prevent the development of that FLU one can lift the corner of the mouth slightly as if to smile. The feed back mechanism to the brain releases a very powerful internal drug. Well, there you are Christine! Your comments are straight to the point. I hope you are and remain ‘flu-less’!